PHILADELPHIA - Kiko Alonso was barely back on the field when a pass bounced off a receiver's hands and into his arms. 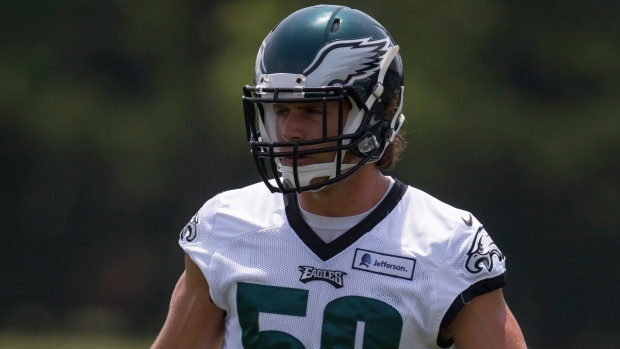 The Philadelphia Eagles expect more big plays from their new linebacker. Alonso, acquired from the Buffalo Bills in a trade for two-time All-Pro running back LeSean McCoy, returned to practice Tuesday after missing two weeks because of a concussion. "I feel comfortable," Alonso said, adding he's not certain if he'll play against the Baltimore Ravens on Saturday night. Coach Chip Kelly is cautious in the preseason. He held Sam Bradford and DeMarco Murray out of the preseason opener, so it's likely Alonso may wait another week for game action. The Eagles will hold joint practices with the Ravens over the next three days, however. "I think mentally, he's good, but he has been out for two weeks, so he'll go through agilities and individual drills and maybe just a little 7-on-7," Kelly said. Alonso sat out last year after tearing his ACL. The Eagles are counting on him to play like he did his rookie season. Alonso, a second-round pick from Oregon where he played under Kelly, had 87 tackles, four interceptions, two sacks and two fumble recoveries in 2013. Matt Barkley had better numbers in Philadelphia's 36-10 win over Indianapolis, but that doesn't give him an advantage over Tim Tebow for the No. 3 quarterback job. Barkley played with some starters and backups. Tebow was on the field with third-stringers and deep reserves. "There's a couple missed communications where some things broke down that were not their fault," Kelly said. "So they have to kind of make some adjustments on it. But I thought they both, when they had time, threw the ball very well, were accurate with their throws." Inside linebacker Mychal Kendricks and safety Jerome Couplin returned to practice Tuesday. Linebacker DeMeco Ryans will be back on Wednesday. Safety Earl Wolff (knee) and tight end Zach Ertz (core muscle surgery) didn't practice. Kelly seemed frustrated by Wolff's lack of participation. "He says he can't run with his knee," Kelly said. The Eagles signed rookie linebacker Dasman McCullum and waived Jordan Dewalt-Ondijo, who suffered an ankle injury. McCullum played defensive line his final two seasons at Southern Miss.